Omni-channel is the buzz word today; from retailers to distributors to manufacturers everyone wants to be part of the Omni channel trend. Why, because customers are demanding it. Customers today interact with brands across multiple channels and expect a seamless, consistent brand experience regardless of the channel they are using. With businesses lacking a centralized information system (they have multiple standalone systems to take care of each one of these channels and various other activities) integration is the only solution for them to live up to these customer expectations. 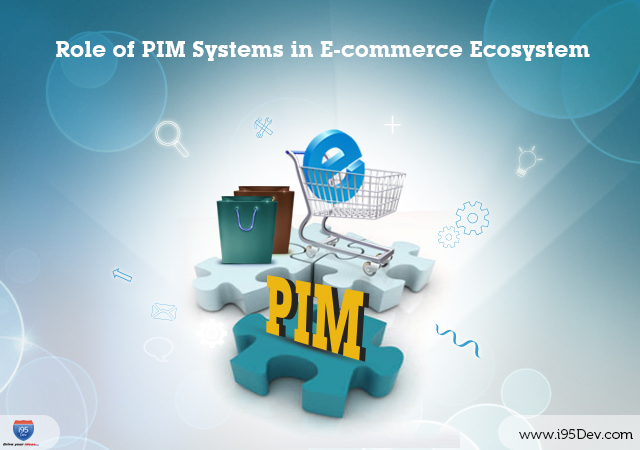 The integration does two things, one establishes communication between each one of the disconnected systems and two chooses one of these systems to act as a master (for a particular data point like customer – ecommerce store, inventory – ERP system, etc.). While each one of these data points (product information, inventory, customer information, orders, etc.) 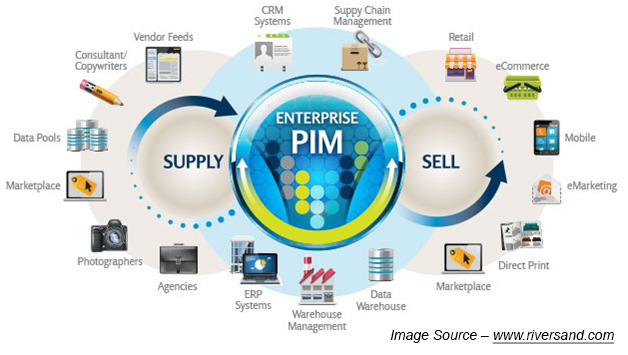 are critical for the success of business product information is where it all starts and this is where the need of a Product Information Management (PIM) system becomes apparent. A PIM, as shown below, can very easily aggregate information from multiple sources and then distribute the same to various platforms. In this blog we will look at challenges that businesses today face and which can be addressed by a PIM system and other benefits of a PIM system. Businesses find it extremely difficult to manage the product portfolio with the increasing number of SKUs they offer, be it big brands, private labels or general variation in product lines. Existing management systems and manual processes are slow and cannot coup with the growing product databank and the increasing expectations of different stakeholders. Adding new products to the system is a lengthy and time consuming process. Adding new products during festive season deserves spontaneity, but existing time consuming processes killed the time to sell. Inconsistencies in the product information (lack of standards, quality of data, etc.) often create problems within the enterprise and with the external stake holders leaving customers unsatisfied and impacting the brand. Lack of proper standards also made listings on third party channels like eBay and Amazon cumbersome depriving brands an opportunity to truly leverage these channels. The inconsistent information across channels also had a huge impact on the customer experience and brand perceptions. Consolidated product information from incongruent systems and determined multiple facets of records and managed respective hierarchy, structures, features, authentications, approvals, etc. effectively. Involved updated technology to build a scalable solution that enabled enterprises to add and update products easily and quickly. Offered a single reliable view of the product information to all the stakeholders; single repository of product information which is customer ready, validated and accessible across the organization for internal and external stakeholders. Acting as a master PIM can ensure that customers receive consistent product information across channels irrespective of which channel they buy a product from. Build Trust – Consistent product information helps build trust with customers thereby contributing towards building a brand, improving conversions, etc. SEO – We have all heard of the saying “Content is King”. With PIM standardizing all the product information the same can now boost traffic to your store (on all channels) by making it easy for your customers to discover your products through search. Analytics – The information collected in the PIM system can now be used to run useful reports like find popular products, forecasting, etc. giving you valuable insights which were otherwise left undiscovered. Operational Efficiency – With standards defined and a single view of the product information you will now see improved operational efficiency because of reduced errors and reduced manual labor.